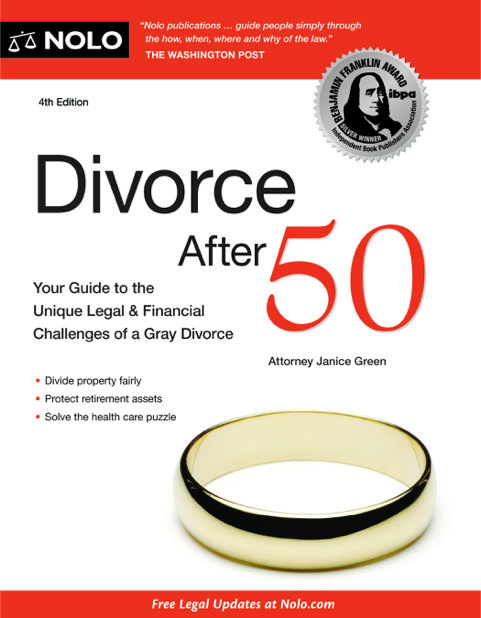 Janice Green is the author of Divorce After 50: Your Guide to the Unique Legal and Financial Challenges (Nolo, 4th Ed. 2019), a book for the person about to embark on a divorce later in life. After age 50, divorce has a different feel, a different context, and issues not encountered in younger decades. You know that having more years behind you than ahead of you is a truth that shifts priorities and refocuses the lens through which you experience life, and now, possibly divorce. That recognition is what sets this book apart from others. Along the way, the nuts and bolts of divorce are framed by the words of late-life divorce clients. The book concludes with essays written by those who moved through a late-life marriage crisis--offering hope, humor, and humility as they describe the challenges they met, and survived, on the other side of their marital crucible. Divorce After 50 may be purchased through your local bookstore, directly online from Nolo Press at www.nolo.com or through www.amazon.com and www.barnesandnoble.com.